In the early 1990s, Bedros Alahaidoyan met Harout Bartanian (1934-2015) at the Alahaidoyan residence in Glendale, California. 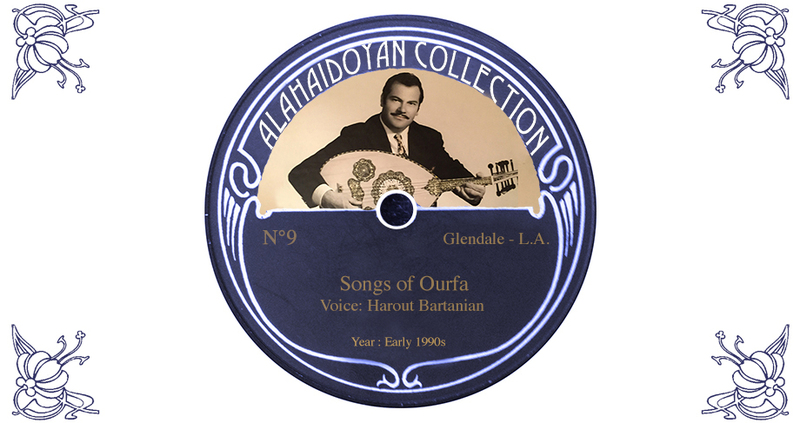 Mr. Bartanian was a vocalist and an oud player from Ourfa. During this meeting, Mr. Bartanian performed 12 songs that he had learned from his elders, all natives of Ourfa, particularly from his grandmother. 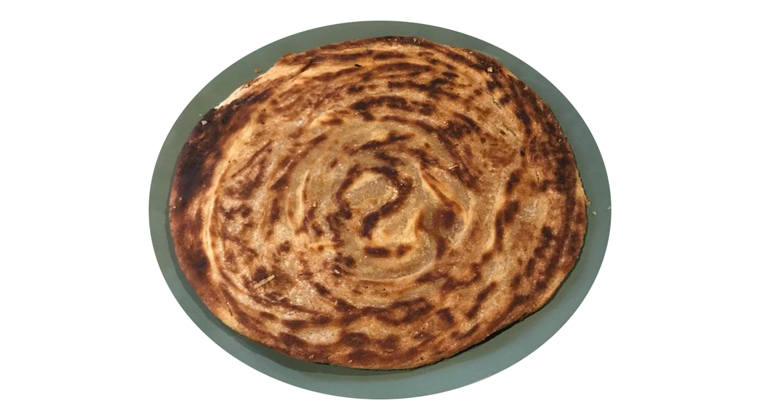 This is the partial biography of our father Haroutioun (Harout) Tchwal Yertanian, or Bartanian, as he came to be known after moving to the US, with his birth on March 6th, 1934. His parents, Hagop and Mary were both survivors of the Armenian Genocide, originally from Urfa, who had found each other and married after finally settling in Ain El Arab, Syria, after walking through the desert for many days. Before having Haroutioun (Harout), Mary had given birth to identical twins who unfortunately did not survive. A year later however, his parents trying one more time, were able to conceive once again, whereby Mary gave birth yet to another twin boys, Garo and Harout (who also was nicknamed “Arshag”). (Interesting note: To tell them apart, his parents decided to pierce Haroutioun’s ear. For years his children used to tease him for it). Syria, late 1940s. 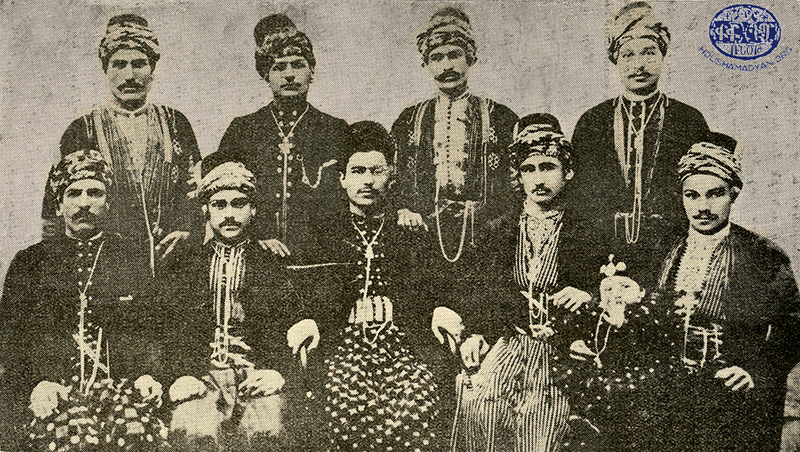 Harout Bartanian, on the right, dressed in black (Source: Bartanian family collection). Sadly, at the age of 5, Harout lost his father to illness. To support her fledgling family, Mary, who had thus far been a housewife, was forced to seek the livelihood of her family by becoming the breadwinner, as she began doing house chores for an affluent expatriate, a single Frenchwoman, washing her clothes and sweeping floors on her knees. This was witnessed by her children, who saw the difficulty of life and the dedication of their loving mother, from a very young age. 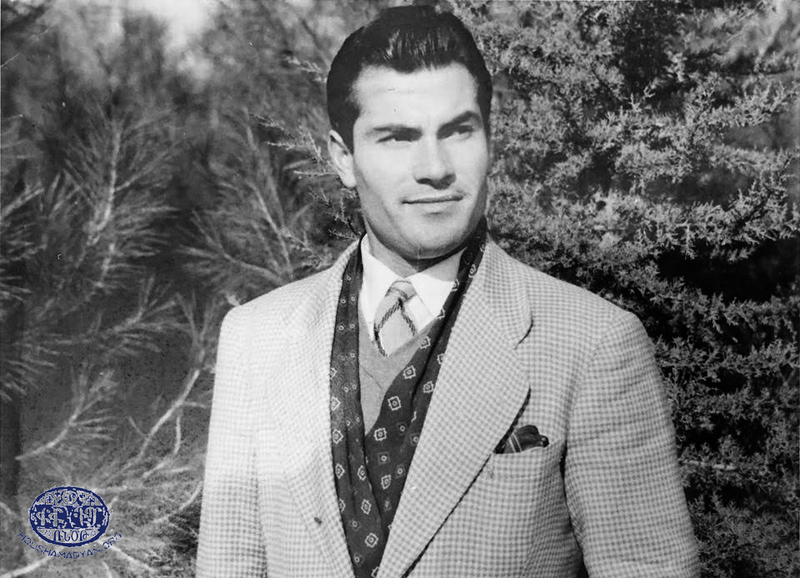 Harout Bartanian in the late 1940s (Source: Bartanian family collection). Garo, Harout’s brother became severely ill. Unfortunately, given the fact that the closest doctor lived a hundred miles away in Aleppo, who would visit their village only once a month and due to the lack of pharmacies, at the age of 11, Garo passed away. This left a lasting impression on Harout throughout his life, having already lost his father 6 years earlier. Given the lack of financial prospects, Mary decided to move to Aleppo along with her child and her sister’s family. The discontent witnessed by young Harout, as he saw his mother exhaustively working to make a meager living to support the two of them, was hard for him to bear. Thus, one day as Mary returned from her work, Harout turns to his mother and says: “You will no longer clean floors nor will you wash other people’s clothes any longer. I am the Man of this house, and I will work and support this family.” He was only 12. True to his word, Harout, at this point goes out and finds himself a job as an apprentice at a barber shop with which he supports his family. Meanwhile, his passion for music was easily apparent at the age of 8; after all, Mary would constantly hear the neighbors come calling on her to allow her son go to their house to sing for them songs that he had heard from his grandmother. At 12, after moving to Aleppo, Mary hands Harout the only heirloom from his father, his golden watch. This was the impetus that would steer the next 70 years of his life, for after he received it from his mother, he decided to go to the nearest music shop, where he had noticed a certain item, his other love, the Oud. He had passed by the store every day before and after going to his work at the barber-shop, and had noticed it hanging on the wall. But, now, holding the warm golden watch in his sweaty palm, standing as he did outside the window pane, he finally found himself this time courageous enough to step in, asking the owner how much the instrument cost. It was 12 pounds. He went to the nearest jeweler and sold his father’s gold watch for 12 pounds, and soon enough, the 12-year-old Harout was running excitedly back home to feel the strings of this royal instrument against his timid fingers. 1) Harout Bartanian, most probably photographed in Lebanon, in the 1960s (Source: Bartanian family collection). 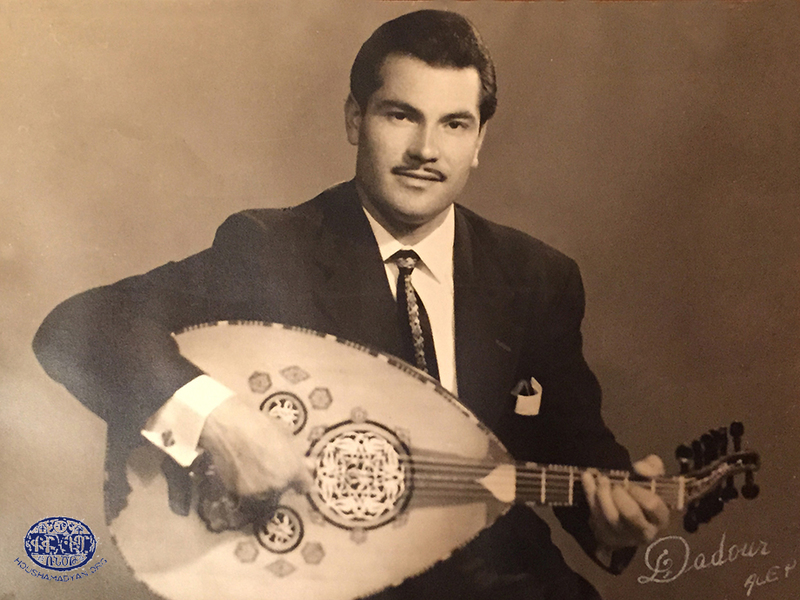 2) Harout Bartanian, photographed while participating the Studio al-Fan program of the Lebanese public broadcaster (Source: Bartanian family collection). At 19 years old, Harout was already getting to audition and then hired by the state sponsored Aleppo radio station, singing live alongside famous Arabic classic performers of the day. At 26, Harout decides to move with his mother and aunt to Beirut, Lebanon to pursue his professional singing career, however, he kept supporting himself and his family as a barber. In 1966, Harout entered a first-time nationally televised contest of Studio el-Fann, which had begun initially with 500 participants competing in categories of music and song, in Arabic. Here, after going through the various stages of selections, Harout found himself moving all the way to the finals, with four other contestants. 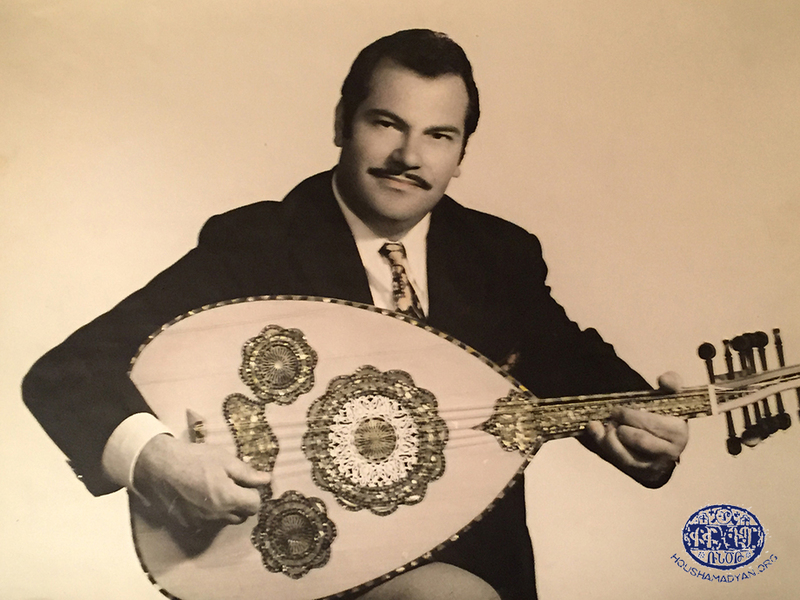 Being the only Armenian and therefore non-Arab participant, singing while playing the Oud, Harout was able to climb to the top position as he won the First Place in the prestigious show that was televised around the entire Arab-speaking world. Harout Bartanian (Source: Bartanian family collection). After assuring the station and the program directors that he was in fact 100% Armenian, in order to sort out the confusion once and for all, Harout proposes settling this matter by asking the TV producers if he could sing a song in Armenian, on live national TV at the end of the show. Intrigued by the multi-pronged solution of this suggestion, they agreed. Here, to the amazement of all, Harout selects the aria of Partsur Sarer, for Anoush Opera. The complainant phone calls to the TV stations were no more coming in. On May 10th, 1992 Harout sat there, surrounded by his loved ones, holding the same tender hand of his beloved Hrip, the same one as he did in 1962. This time, they were smiling…but it was a time of goodbye. Having lost his Hrip, Harout was showered with love from his children, and soon enough he was gifted with the birth of two more grandchildren, Hripsimeh and Harout. He was a proud and happy grandfather, and he made sure his grandchildren received the love of their grandmother through him and the loving embraces which he was so generous with in sharing. Life is impermanent, and all things are conditional. Photographs from performances by Harout Bartanian in the 1970s and 1980s (Source: Bartanian family collection). The years had been taking grinding down on him, and in 2013 Harout found himself being treated in the hospital for a pelvic fracture due to a fall on Christmas Eve. However, years of battling diabetes and its bittersweet treatment of insulin had taken their toll on his health, as he passed away on March 10th, 2015. 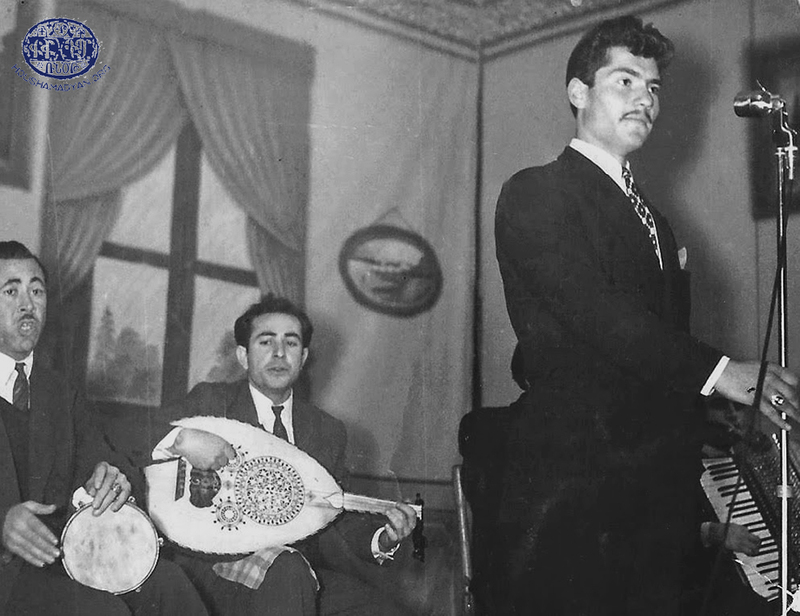 Along with his four children, Hagop, Mary, Garbis and Kevork, Harout leaves behind him a legacy of music, and especially traditional songs from Urfa that he had learned from his grandmother. This, in addition to the countless people who have come to be touched by and see his humanity, in various aspects of his life and deep sense of generosity and independent spirit. 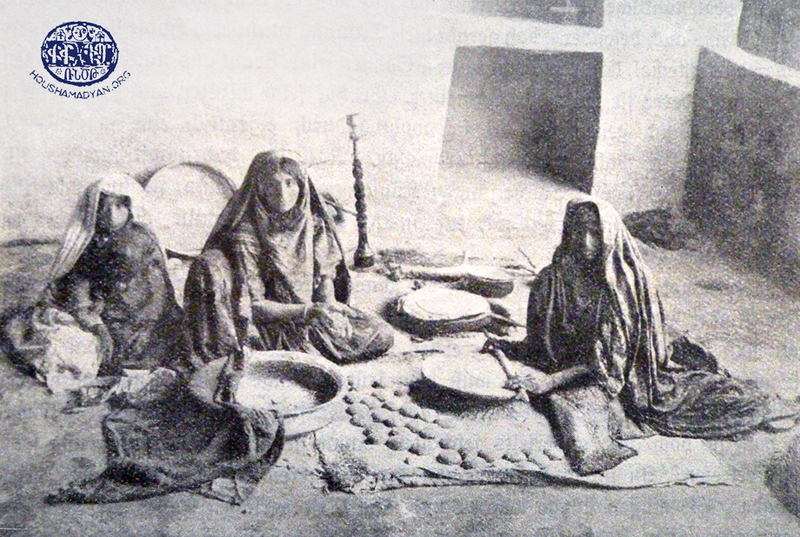 Women from Ourfa and the surrounding area in their traditional dress (Source: Album de la Mission de Mésopotamie et d'Arménie confiée aux Frères-Mineurs Capucins de la Province de Lyon, 1904. Photographer: Father Raphael). 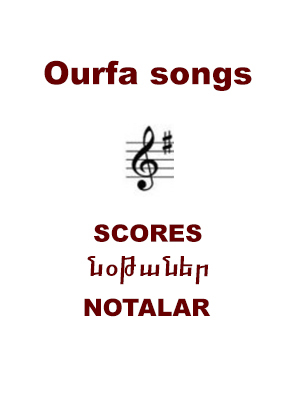 Ourfa, the famous musical ensemble of Garabed and Djrdjo. 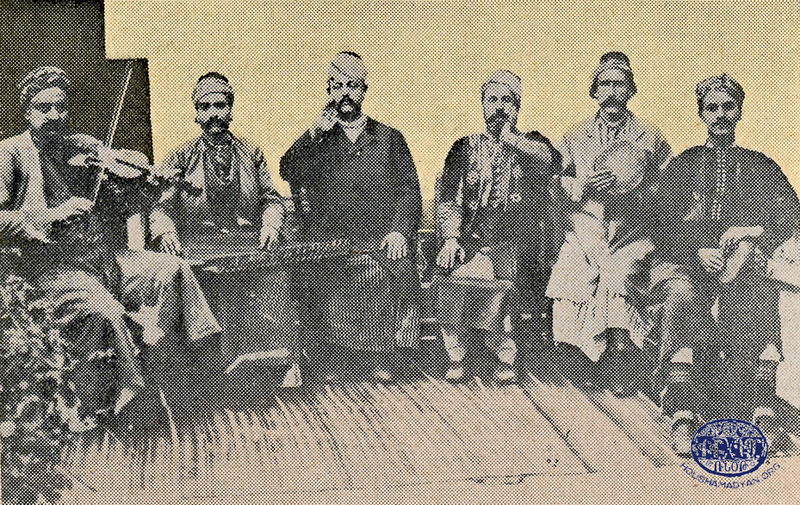 From left to right – Garabed (on the keman), Haroutyun (on the qanun), vocalists Asori Djrdjo and Djure Maho, Mrdjo (on the def), and Khacho (on the debelek) (Source: Aram Sahagian, Heroic Ourfa and Her Armenian Offspring, Beirut, Ourfa Compatriotic Union, 1955). 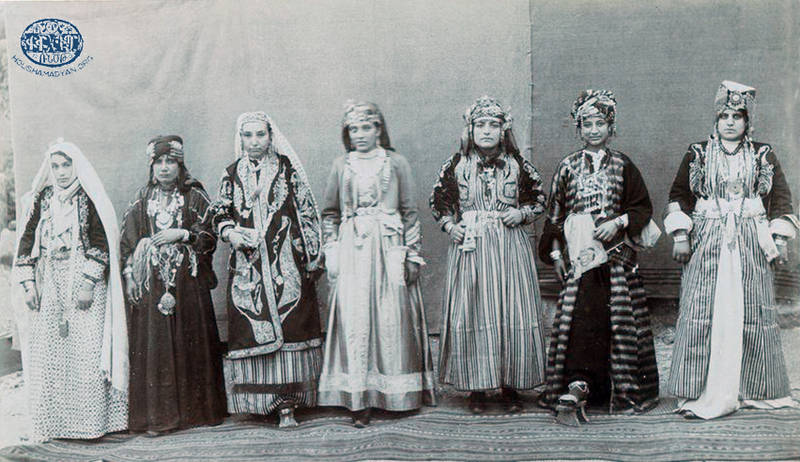 Residents of Ourfa in their traditional dress (Source: Aram Sahagian, Heroic Ourfa and Her Armenian Offspring, Beirut: Ourfa Compatriotic Union, 1955). The students and faculty of the Franciscan School of Ourfa. 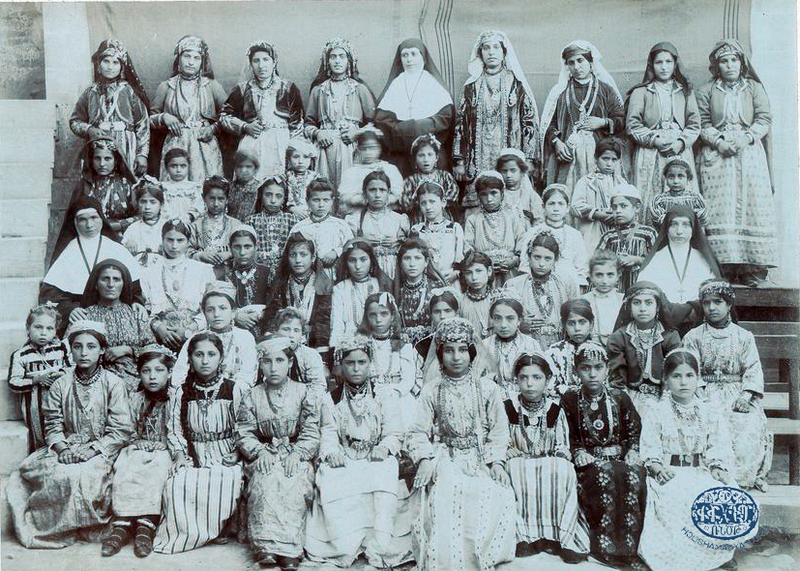 The students are photographed in traditional dress (Source: Aram Sahagian, Heroic Ourfa and Her Armenian Offspring, Beirut: Ourfa Compatriotic Union, 1955). 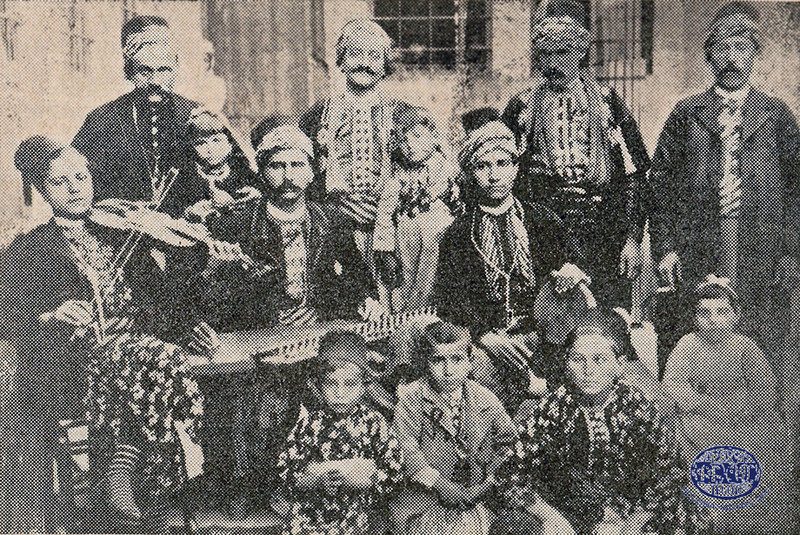 A local musical band in Ourfa (Source: Aram Sahagian, Heroic Ourfa and Her Armenian Offspring, Beirut: Ourfa Compatriotic Union, 1955). Ourfa, 1900. 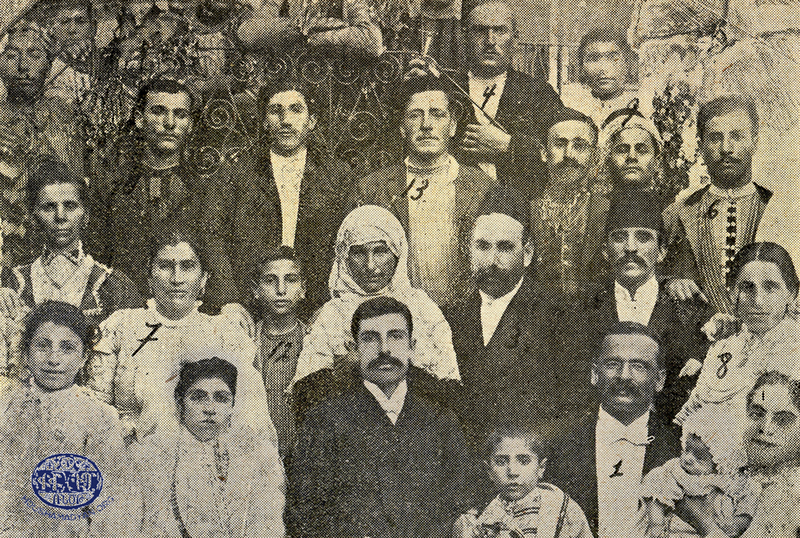 The wedding photograph of Armenag Attarian. We were unable to identify the other individuals in the photograph (Source: Aram Sahagian, Heroic Ourfa and Her Armenian Offspring, Beirut, Ourfa Compatriotic Union, 1955). 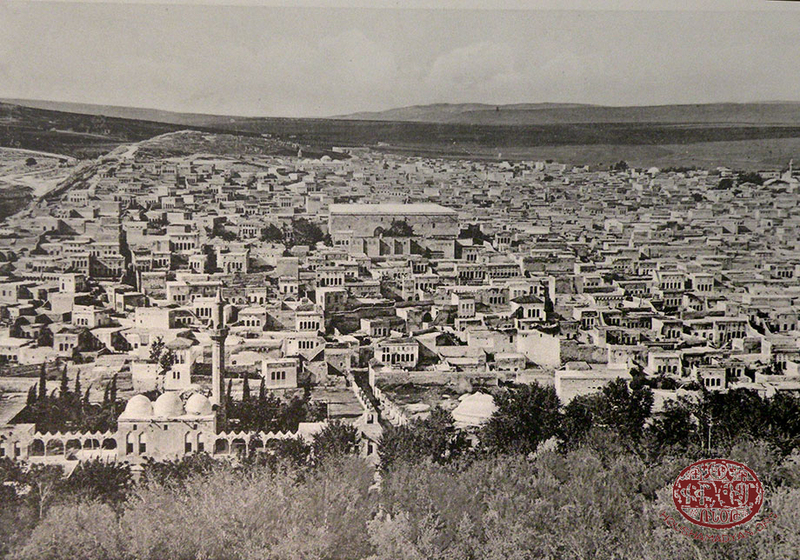 Ourfa, circa 1919-1920. The area around the Father Abraham Pond (Source: photograph by Father Gabriel Bretocq, Archives départementales de l’Eure. Fonds Gabriel Bretocq). Ourfa, preparing food (Source: Der Christliche Orient, Potsdam, 13. Jahrgang, 1912, Juli, Heft 7). Houshamadyan hereby presents a new podcast dedicated to Ourfa and its once-vibrant Armenian life. 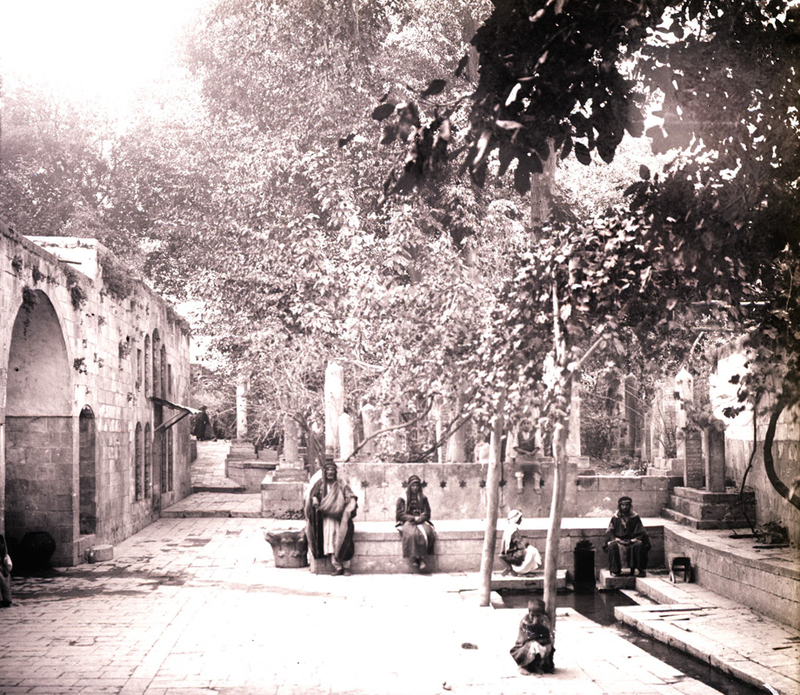 All of the photographs presented here are old photographs from Ourfa, and the Armenian song that accompanies the podcast is also from the repertoire of the city. The podcast was prepared by Silvina Der Meguerditchian and Karin León Henneberg. The song, accompanied by the oud, is performed by Harout Chval-Yertanian (Harout Bartanian).